NOW it is time to put fuel into this campaign. Join us June 19th at 6pm for an inspiring evening at the stunning 1850 House in Rosendale. Refreshments will be served. Cash bar. Come meet Juan and mingle with other supporters determined to hold the office of Ulster Sheriff to our highest values. Make your donation online at www.figueroaforsheriff.com/donate or by check at the event made payable to Juan Figueroa for Sheriff. Join Ulster People for Justice & Democracy at our General Meeting! This meeting will feature an educational presentation on compassionate approaches to the opioid crisis, as well as Q&As with two candidates: Juan Figueroa for Ulster County Sheriff and Jumaane Williams for New York Lt. Governor. We’ll also hear updates from our working groups, including how to get involved in the important work we’re doing fighting for universal healthcare for all New Yorkers, keeping an eye on what’s going on in our county legislature, and more! Meet the Candidates: Juan Figueroa for Ulster County Sheriff and Jumaane D. Williams for New York State Lieutenant Governor. Educational Presentation: Chatham, NY Police Chief Peter Volkmann will present on Chatham Cares 4 U, a compassionate and forward-thinking approach to the opioid crisis that allows police to act as allies, rather than the enemies, of residents suffering from addiction. Chief Volkmann will speak to us on behalf of the Law Enforcement Action Partnership. Hear updates from our working groups & learn how to get involved! Juan served twenty-two years in the United States Marine Corps, retiring as a Chief Warrant Officer and twenty-five years in the New York State Police. He has patrolled the roads of Ulster County and worked in the Bureau of Criminal Investigations. He has successfully taken down drug cartels, worked to stop corruption and fought to keep us safe abroad. He is seeking the Democratic nomination to be the next Sheriff of Ulster County. Councilman Williams, who is a member of the Brooklyn Chapter of NYPAN and was a Bernie Sanders delegate to the 2016 DNC Convention, has been a unique progressive voice in New York State, where he was a founder of the NYC Council Progressive Caucus, an author of legislation ending the notorious and racist “stop and frisk” police policy, a fighter for civil and immigrant rights, a main champion in securing tens of thousands of summer youth jobs, and has had many other notable accomplishments. He has engaged in civil disobedience numerous times, and recently putting his body on the line to try to prevent the deportation of immigrants. 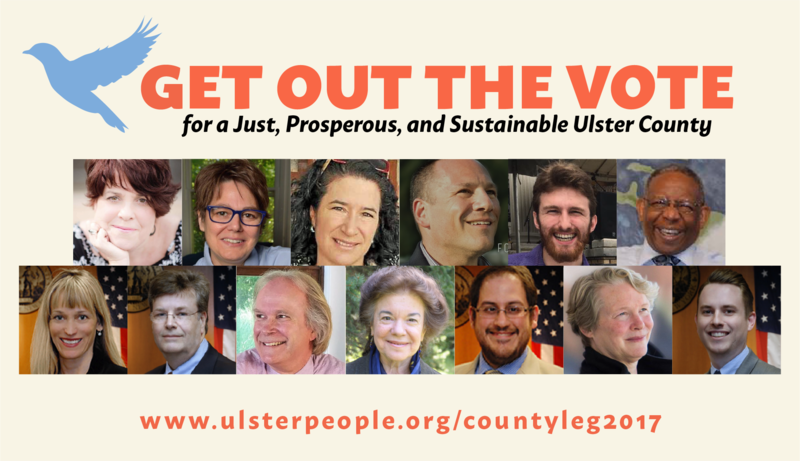 GET OUT THE VOTE FOR ULSTER COUNTY LEGISLATURE! Here’s how to plug in to the GOTV operations of UP-endorsed candidates with contested races. Like so many others, Laura was inspired to get active post- November 2016, learning the political landscape from the ground up and bringing authenticity and passion to the rebuilding of our democracy. 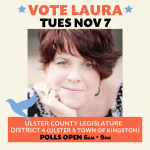 TO VOLUNTEER FOR LAURA, contact Mike Kelly at 518-929-3546 or by email. As a legislator, Jennifer has worked for job-creation, affordable medical care, and social and racial equity. She is deeply committed to her constituents, who include residents of public housing, the elderly, and immigrants. 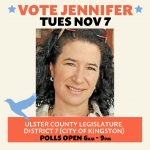 TO VOLUNTEER FOR JENNIFER, send her an email and put “GOTV” in the subject line. A professor at SUNY-New Paltz and founding member of Move Forward New York, Glenn will work for family friendly solutions to immigration issues and sustainable economic development in Plattekill and all of Ulster County. TO VOLUNTEER FOR GLENN, send him a message via Facebook..
Andrew represents the new generation of emerging political activists. He combines a commitment to economic development in southern Ulster County with a passion to protect the health and beauty of our mountainous region. He is also the only candidate in Ulster County to be endorsed by Our Revolution. 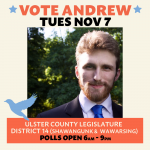 TO VOLUNTEER FOR ANDREW, contact his canvassing team by email. 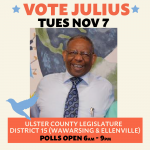 Julius serves as a pastor in Ellenville, runs a soup kitchen, chairs the board of the local hospital, and has long been an effective advocate for the most marginalized and vulnerable in his community. Although Julius’ has an opponent, his numbers are looking great after his decisive win in the primary. In the last few weeks he’s been out there helping Andrew Zink, running in the nearby district. UP volunteers can do the same! 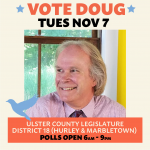 As a member of the Marbletown Town Board since 2009 and a strong advocate for the environment, Doug was a leader in banning hydraulic fracking in Marbletown. TO VOLUNTEER FOR DOUG, send him an email. Kathy is a physician, public health activist, and staunch advocate for grassroots citizens. As a strong and articulate environmentalist, she was a leader in the Coalition Against the Pilgrim Pipeline. 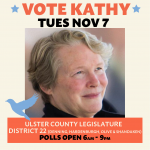 TO VOLUNTEER FOR KATHY, send her an email or call 845-688-9702 or send a Facebook message to Friends of Kathy Nolan. Help spread the word on social media! 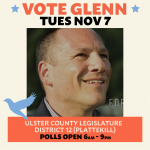 Like our Glenn Geher endorsement post and share it with your friends in District 12 (Town of Plattekill). Like our Andrew Zink endorsement post and share it with your friends in District 14 (Town of Shawangunk & Town of Wawarsing). Like our Tracey Bartels endorsement post and share it with your friends in District 16 (Town of Gardiner, Town of Shawangunk). Like our James Delaune endorsement post and share it with your friends in District 17 (Town of Esopus & Town of New Paltz). Like our Doug Adams endorsement post and share it with your friends in District 18 (Town of Hurley, Town of Marbletown). Like our Manna Jo Greene endorsement post and share it with your friends in District 19 (Town of Rosendale & Town of Marbletown). Like our Hector Rodriguez endorsement post and share it with your friends in District 20 (Town of New Paltz & Village of New Paltz). Like our Kathy Nolan endorsement post and share it with your friends in District 22 (Towns of Denning, Hardenburgh, Olive, Shandaken). Like our Jonathan Heppner endorsement post and share it with your friends in District 23 (Town of Hurley & Town of Woodstock). Follow us & like our election posts on Instagram! Join us at a rally to defend DACA & demand that Congressman Faso step up and fight for his constituents! Tuesday, September 5 at noon, 721 Broadway, Kingston. Congressman Faso has said he supports legislation that would help young people with DACA remain permanently in the United States but we don’t need words, we need action! Join us to demand that Congressman Faso push his party leaders to pass legislation now that will provide a permanent solution for young people, with no strings attached. BACKGROUND: For five years, the Deferred Action for Childhood Arrivals, or DACA, program has provided nearly 1 million young people, including 50k New Yorkers, protection from deportation, the opportunity for higher education and jobs, and brought stability to our communities. But now DACA is at risk. We have heard the Trump administration might come out with a decision this week or early next and we must be ready! Last month, 10 anti-immigrant Attorneys General issued an ultimatum to the Trump Administration: either end the DACA program by September 5 or we’ll take you to court. So far, Trump has not responded. But we must be ready for whatever happens. The NYIC is calling on all of our members, allies and partners to be prepared to step up to protect DACA and New York’s DREAMers. Multiple legislative solutions have been proposed in Congress but Speaker Ryan has not prioritized this urgent issue. We demand that congress pass a permanent legislative solution for DACA, that includes a path to citizenship, and has not strings attached! We need to make sure that our NY representatives knows that the people of New York are calling on them to #DefendDACA and all 11 million undocumented immigrants. NYIC is working together with our members and partners in the Hudson Valley, Central NY, and NYC to plan public responses to pressure our representatives to take action NOW. 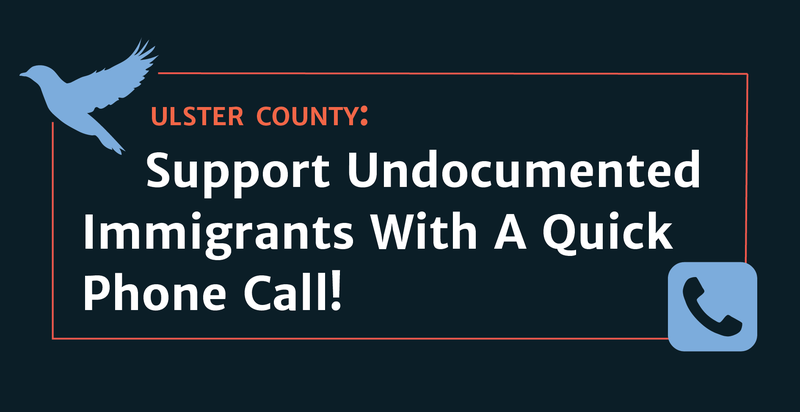 Support Undocumented Immigrants With A Quick Phone Call! This coming Tuesday (June 20), the Ulster Co. Legislature will vote on Proposed Resolution 138, which would ban cooperation with federal immigration agents seeking to arrest and/or deport Ulster County undocumented immigrants. The passage of the resolution may well come down to the decision of a few legislators. Please support undocumented immigrants in Ulster County by making a quick phone call to your legislator in support of Proposed Resolution 138. Please make a special effort if you are represented by: Craig Lopez (Pine Bush/Wawarsing), Kevin Roberts (Plattekill), Dean Fabiano (Saugerties/Ulster), and Mary Wawro (Saugerties), John Parete (Shandaken/Olive/Denning), or TJ Briggs (Ellenville/Wawarsing). This will only take a few moments and is an important show of solidarity. Once you know your county legislative district, go to http://ulstercountyny.gov/legislature/legislative-members to find their phone number. More detailed instructions are available here. Hello. My name is _______________, and I am a constituent in your district. I urge you to vote YES on Proposed Resolution 138 on Tuesday evening. Deportation breaks up families and causes trauma and heartbreak. We need to protect our neighbors. Hello. My name is _______________, and I am a constituent in your district. I urge you to vote YES on Proposed Resolution 138 on Tuesday evening. Deporting law-abiding residents actually makes all of us less safe because it destroys the relationship between law enforcement and local communities. Hello. My name is _______________, and I am a constituent in your district. I urge you to vote YES on Proposed Resolution 138 on Tuesday evening. Many undocumented immigrants are hard-working members of our community who contribute to the local economy in important ways. Hello. My name is _______________, and I am a constituent in your district. I urge you to vote YES on Proposed Resolution 138 on Tuesday evening. We are a nation of immigrants. The history of America is the history of people who fled poverty, starvation, and terror in hopes of a new life. It is who we are as a nation. Please take the time to do this. Ulster County is a small place, and even a few phone calls on an issue have a great deal of influence. This coming Tuesday (June 20), the Ulster Co. Legislature will vote on Proposed Resolution 138, which would ban cooperation with federal immigration agents seeking to arrest and/or deport Ulster County undocumented immigrants. The passage of the resolution may well come down to the decision of a few legislators. Please take action in support of this issue by calling your legislator!